No matter how outdated or clichéd you think fairy tales have become, their appeal remains undeniable today. The whimsy and call for the suspension of belief, as applied to the mundane of our everyday, grasps at our hearts, evoking a sense of nostalgia and hope. I didn’t know who Amanda Lovelace was, didn’t know her book the princess saves herself in this one was the 2016 winner of the Goodreads Choice Awards for Best Poetry. I didn’t know about her former acclaim or that she’s found grassroots success through her Twitter (@ladybookmad). As a fellow writer and aspiring poet, this is a unique place to write a book review from, a place of minimal previous knowledge of the author, a place of instant admiration and wonder. 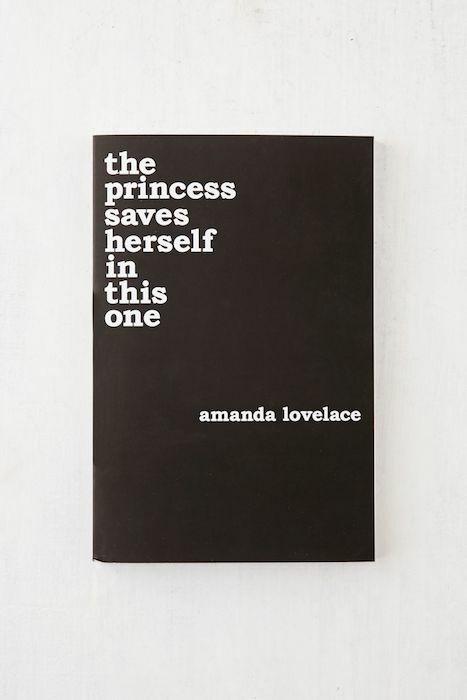 In a most modern and innovative way, Amanda Lovelace has used her poetry to take the reigns of one of my most favorite fairy tropes: the princess being saved from her demons. This collection is broken into four parts and presented to us as “the princess, the damsel, the queen, and you”. The first three chapters beautifully weave together the author’s story, exploring her relationships with men, family, friends, society, her body, her writing and herself. We as readers, as women, as humans, can relate to nearly all of the elements of her story. For her final chapter “you”, Lovelace addresses the reader directly in a poetic love letter, promising that our work in progress (our work, our writing, our selves) is “pending: your own happy ending. – you’ll get there.” It addresses themes of love, family, mourning and empowerment, while keeping the reader both engaged and included. It provides an uplifting template for the stages in our lives, and our faith in each other. If you’re feeling bombarded by today’s news headlines and the angst of the world’s political unrest, my prescription as an untrained and unlicensed therapist is this poetic journey alongside Amanda Lovelace. Believe in the fairy tale, her writing style begs of us; her syntax is revelatory, honest and endearing, her collection is a safe place. For the harder and more dreary days, Lovelace’s poetry will deliver on its promise, and remind me that the princess can always undoubtedly save herself. On her website, Lovelace describes herself as growing up a word-devourer & avid fairy tale lover. She has her B.A. in English Literature with a minor in Sociology. the princess saves herself in this one is her debut poetry collection & the first book in the women are some kind of magic series. A lifelong poetess & storyteller, Lovelace currently lives in New Jersey with her husband, their moody cat. The second book in the series, the witch doesn’t burn in this one, will be published in 2018. Lovelace’s poems and their inventive forms make this collection a heartfelt exploration of love for oneself and others.